Three Sinha Group of Companies Managing Director Manjula Ariyakumara receiving the Gold Award. Three Sinha Group of Companies, an organization that constantly strives to break new barriers in the roller door industry won the Gold Award of National Level, Extra Large Category at the Sri Lankan Entrepreneur of the Year Award 2018 organized by the Federation of Chambers of Commercial and Industries of Sri L Lanka. 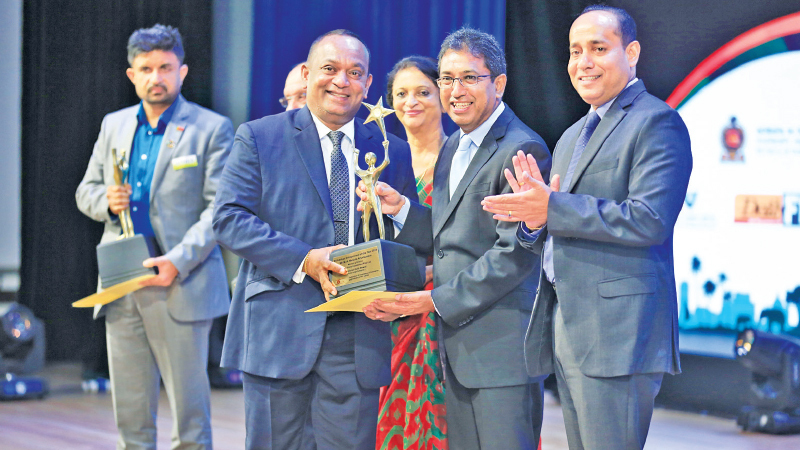 Three Sinha Group of Companies Managing Director Manjula Ariyakumara received the prestigious Gold Award from Minister Dr Harsha de Silvaat the gala event held in BMICH. The latest introductions by Three Sinha are its state of the art eco friendly solar power systems. While diversifying its business network Three Sinha Industries has started constructing low cost prefabricated steel buildings using state of the art technology. Three Sinha has introduced a range of products to the Sri Lankan market, namely roller doors, roller shutters, sectional overhead doors, window shutters, fire resistant doors, aluminium fabrications, sensor doors, stainless steel, steel railings and stairways, poly-carbonate canopies, stainless steel pantry cupboards, rack systems, automatic barriers and motor operated sliding gates and swing gates. Three Sinha also has the distinction of being an ISO 9001:2008 certified organizations. Having commenced operations as a small scale industry.